The Shell Mandala is one of John's more unusual 'mandala' paintings, in that its subject matter portrays the crashing of a wave onto the shore of a beach that consists of shingle, shells and pebbles. These smooth and wet pebbles are massed together at the bottom of the painting like a crowd of beggars, their glistening surfaces reflecting the rays of light that are refracted from the aquatic chaos of sand, foam, water and light that cascades down upon them. Many of the amorphous spiral waves that pull outwards from the complex 'vortex' at the lower centre of this painting relate to the microcosmic tides and currents that affect all liquids, like a storm in a teacup. 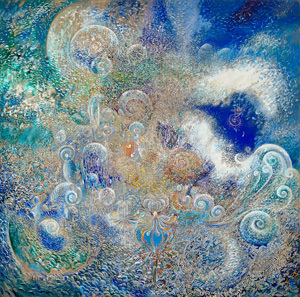 This vortex, along with the sketchy spiral form within the blue of the wave's white mouth, is the only calm area of this painting, like the proverbial eye at the centre of a storm. The shell title of this mandala echoes the natural spirals of forms found in nature, and especially of seashells in this particular context.